Nature's Poison Ivy Relief | Relief the suffering itch and heal the rash from Poison Ivy using our Native American recipe for comfort using our natural, organic, homeopathic Sweet Fern remedy! Stops the Itch and Heals the Rash In Just a Few Days! Why suffer with poison ivy when you don’t have to? Why wait for the blisters and itching to drive you crazy? With most over-the-counter topical medications, you will not find relief even after you have paid their hefty price. End the suffering now with Natures Poison Ivy Relief . We use a Native American recipe that calls for the use of sweet fern. Sweet fern is a shrub that looks like a fern. It is native to the eastern U.S. and has beautifully scalloped, deciduous leaves. It is an aromatic astringent herb, used mainly to control bleeding, diarrhea, and as a wash for poison ivy rash (and other rashes). It is a member of the wax myrtle or bayberry family, which grows nearly worldwide, with about 40 species of small trees and shrubs, 5 native tree species, and 3 shrub species in North America. The leaves are very aromatic when boiled. Sweet fern is a native american medicine used in the curing of poison ivy. I grew up on a dairy farm in Maine and have used the remedy for more than 60 years. My grandfather taught me how to locate and prepare it when I was a boy, having learned it when he was younger, and I have passed it on through my own family, neighbors, community and now the world. 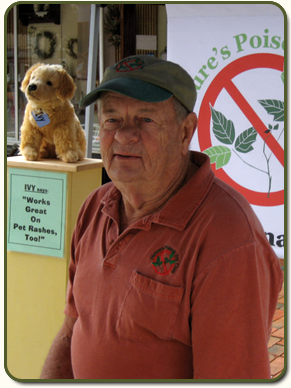 I started marketing Natures Poison Ivy Relief and it is now in stores in Maine and six other states. The product is also being purchased here online across North America and I even get inquiries from other countries. I dry the fern and ship it directly to you . Poison ivy relief is very easy to use – simply boil the leaves in a quart of water for approx. 20 minutes or until it looks quite dark. (enjoy the aroma) Strain off the leaves and let it cool. Once cooled, apply to affected area. You should see results in approx. 24-48 hours. The itching will stop immediately. Apply 4-5 times daily for best results. Works Great On Pet Rashes Too! "I have used this product for many years and it never fails me!